As the "egg season" is coming to a close, it is time to reflect on our results and begin planning ahead for next year. This year, we offered EGG SHARES for both duck and chicken eggs and served 5 families besides our own. We enjoyed caring for our hens and providing delicious, nutricious eggs for your families' tables. Our hens are slowing down in production as the days turn colder and the daylight becomes less and less. If last year was any indication, we will have eggs available all winter long, but certainly not at the peak levels of a dozen eggs or more each day. In anticipation of reaching our goal of providing eggs for more families for the 2013 season, we hatched 36 new chicks with the hopes of gaining more hens. Our first clutch of 13 chicks born on June 3, 2012 will begin laying sometime in November. Our second clutch of 7 chicks born in July will begin laying sometime in December. And, our last clutch of 16 chicks born in August will begin laying sometime in February. 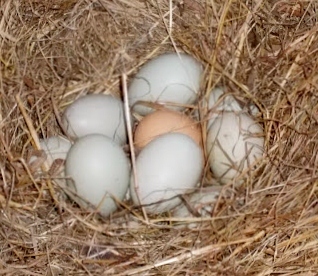 Of course, not all the chicks will be hens, but by our estimation, our flock of hens should be producing roughly 30 eggs each day or 17 dozen eggs each week by June. We will begin taking CSA EGG reservations March 1, 2013 for the season on a first come, first served basis. "Happy Hens Make Delicious Eggs." It's true. Our hens are loved, really loved and well cared for. They have a spacious, airy, 8x8 hen house with exterior nesting boxes. Their new home was built less than a year ago and is free of drafts and inclement weather and has plenty of places for them to roost. Our hens are handled, held, pet and loved on every day. Whether they are still producing or retired in old age, (Our retired hens live out their lives until their natural deaths on our farm.) they are treated respectfully and gently handled. Our girls have full access to a large play yard where they are safe from predators and can scratch (one of their favorite activities), take dirt baths or sun themselves to their hearts content. We feed our hens a good quality mixture of fresh greens, cracked corn and hen scratch and they are provided with clean water daily. In the Spring, Summer, and Fall months, the hens rotate to our chicken tractors, where they can feast on the bugs, worms, and green grasses they love to eat. Because our eggs are from a variety of breeds, the eggs come in a variety of colors from medium brown to blue-green. We are planning on adding prized Copper Maran chickens to our flock for 2013. 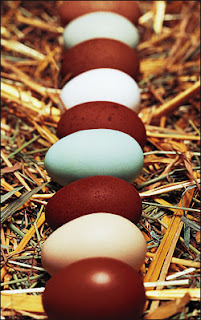 These hens lay beautiful chocolate brown colored eggs- made famous by fictional character, James Bond and are esteemed by chefs for their color and richness. Because our hens live happy lives, eating natural foods, the eggs are the tastiest and most yellow-yolked eggs you can find! They are high in Omega-3 oils and are always fresh. 1. Chicken Egg Share: This share consists of one dozen, fresh, assorted chicken eggs picked up (or delivered with prior arrangements) each week on a mutually agreed upon schedule. The cost for this share is $50 for the 18 week season. We will begin taking reservations March 1, 2013. A deposit of $25 will be due at the time of the reservation with the remainer of the balance due in advance of the season beginning June 1, 2013. 2. Duck Egg Share: This share consists of one dozen, fresh, assorted duck eggs picked up (or delivered with prior arrangements) each week on a mutually agreed upon schedule. The cost of this share is $70 for the 18 week season. We will begin taking reservations March 1, 2013. A deposit of $35 will be due at the time of the reservation with the remainer of the balance due in advance of the season beginning June 1, 2013. Please, feel free to contact us at 207-323-4982 to get more information regarding the program or to sign up for your share.